My journey started on the 18th of November 2015 as I boarded MAS airline at 1.00 in the morning. The flight was delayed and I ended up arriving at Incheon International Airport later than the other winners at around 9.00 am. Luckily, a KTO representative was waiting for me at the Arrival hall and quickly took me to our hotel in Seoul, the Center Mark Hotel. Each one of us had our own room. The Wifi connection at the hotel and other places was awesome! The scenery that greeted me in Korea was simply breathtaking. The colours of Autumn were everywhere. It was cold but not freezing cold. I brought along a winter coat but I ended up not using it at all. A fleece cardigan and a few layers of clothes were enough to keep me warm throughout the journey. Our trip was handled by Hana Tour and I was introduced to the representatives including Ms Kim So Yeon, who was fluent in English and treated us like a friend and was a wonderful host and guide. She and her friend took extra care of myself since I was the only Muslim in the group and made sure I was able to find halal food. I ended up eating a lot of vegetables and seafood with ‘bap’ or rice and ‘ramyeon’ or noodles. Other food items on my list were banana ‘uyu’ or milk, triangular gimbap, fresh pomegranate juice and seafood ‘pajeon’ or pancake. Korea is indeed a heaven for food lovers. My English-speaking group consists of myself, Lucky Ann Llanes from The Phillipines, Vera Lee from Singapore, Natcha Poompradit from Thailand and Theresia Kurniawan from Indonesia. Even though it was the first time meeting each other and our age differs, we quickly grew close even before the actual visit. Once we had found out who the winners were, we quickly form a group on Kakao Talk and started messaging each other to discuss the trip and issues surrounding it. We all love Korea. By the end of trip, all of us had become good friends and I felt like the eldest sister to these girls. The first two attractions that we visited were the Ice Gallery and Trick-Eye Museum in Hongdae. I felt like a kid again as we took hundreds of selfies and wefies there. Lunch was at Nature Kitchen, a buffet-style restaurant. The selection was pretty amazing. We also went to Hello Kitty Cafe and the new Kondae Common Ground Pop-Up Store nearby. My friends ate a rainbow cake at Dore Dore cafe there. Dinner was my favourite – grilled mackerel and seafood pajeon with rice and banchan or side dishes. After dinner at Eomoni Saengseon restaurant, we walked back to our hotel in Insadong. We returned to the hotel to recover from jet-lag and also to post the photos we took in FB and Instagram as part of our daily task. When we came back we had to write a report for KTO and to thank us for our hard work in introducing these attractions, we received a lot of gifts and souvenirs from KTO including a mini LG mobile printer, a K-smile campaign raincoat, a tumbler, a keychain set, a cap, a MISO notebook, aromatic candle set and a group photo stand. On the second day, we went to Samcheon-dong, an area lined up with attractive shops and art galleries. After a scrumptious breakfast at Slow Park Garden Cafe, we went to Holly-Go Studio nearby to make our own aromatic candles. After channelling our creativity there, we went to a Kpop Idol cafe – The Wiki Cafe, owned by Super Junior’s Sungmin’s mother. It is run by his handsome younger brother. A few of us, including myself were interviewed about our tour by two DJs of Seoul eTBS FM radio station. I answered a lot of questions about kdrama and kfood and kculture. This time, we were also accompanied by 2 KTO officers, Miss Sera and Mr Kang Cheol. After drinking coffees and taking selfies with Sungmin’s brother, we made our way to 55 Beonji Ramen Restaurant to try the delicious but very spicy seafood noodles and tuna rice balls. We then visited Deoksugung palace, the smallest palace in Seoul, just in time to watch the daily Guard-Changing ceremony. The palace in autumn was very beautiful with red, orange and brown colours of autumn. It felt magical and serene. The next stop was the newly-opened Grevin Wax Museum where many celebrities were waiting to take pictures with us. Even Michael Jackson, John Lennon, Marilyn Monroe, Barrack Obama were there! But of course we had more fun taking selfies with Lee Min Ho, Hyun Bin and Park Eun Hye. After shopping for souvenir at Good Morning Shopping Mall and a having shabu-shabu dinner at nTable at the basement of Dongdaemun Design Plaza, we were taken to Jeongdong Theatre to experience playing janggu, a traditional drum and later to watch a stage play, Miso – the Story of Secretary Bae. This was definitely the highlight of this tour for me. We were not allowed to take photos during the performance but we managed to take a group photo with the actors, singers dancers and musicians after the play. Perhaps I would see their faces on kdrama one day! 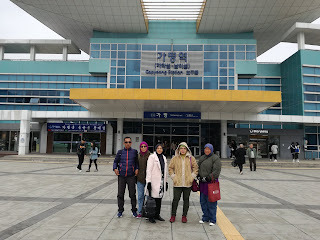 Throughout the trip, we were ferried around in a chartered coach but on the third day, we travelled to Chuncheon Station via ITX Train from Yongsan Station. The train service and condition were excellent and the scenery along the railway was beautiful. You could stop at Gapyeong Station to go to Nami Island, but we continued our ride until we reached Chuncheon. From there, our coach took us to Gimyujeong Station. The latest attraction is the Gangchon Rail Park where we experienced pedalling the rail bike for about 45 minutes via neon-lighted, karaoke-song tunnels and alongside rivers and forests. We huffed and puffed our way until we reached the stop and rested for a little while before boarding an old-style romantic train to go to the end of the trail. It was tiring but we had fun riding the rail bike. Lunch was dakgalkbi – grilled chicken but since it wasn’t halal, I ate tuna gimbap and banana milk bought from a nearby convenient store. Returning to Seoul took about an hour and we felt slightly tired but it did not deter us from shopping to our heart’s content at Myeondong. All brands of cosmetics and fashion accessories were on sale. Nature’s Republic, Innisfree, Holicka Holicka, Iope, Faceshop, etc... The price was quite reasonable and often cheaper than the ones sold in Malaysia. Street food carts started to come out by 5.00pm. Our final dinner was at Todai, a buffet style dinner where we said our goodbyes to the Japanese and Taiwanese groups and the two KTO officers. After returning to the hotel, we decided to explore the nearby Cheonggyecheon stream on our own. The Lantern Festival was being held there and it attracted a very large crowd. Lanterns of all shapes and sizes were on display. You could even make your own mini candle-lighted lantern, write your wish on it and then let it flow away along the river. By the time we got back to the hotel, it was very late and we were very tired but we still had to pack our bags since we would be going home the next day. The final day of our tour arrived and I felt sad to leave my friends, our tour guide and of course, Korea. Before going to the Incheon International Airport, we stopped by at a new mall near Yeouido Park, the Yeouido IFC Mall. It felt like going into Suria KLCC. Since we had done our shopping at Myeondong, we decided to skip the Mall and instead go to the Yeouido Park to take more selfies and wefies in the Autumn colours. To my surprise, the KBS Broadcasting building and the National Assembly (their Parliament) are also located near the park. Since we were rushed for time, we had to literally race to the KBS building and the famous steps where the opening sequence of 1n2d show was usually shot. I felt happy just to be there, even if I did not bump into any celebrities. The Malays have a saying, “kalau tak nampak orangnya, nampak bumbung rumah pun jadilah” – or in my case, jumpa tangga pun jadilah...! Finally, the coach took us to Incheon International Airport. I was surprised to watch a procession of King and Queen and their entourage there. They wore traditional royal costumes and regal headdreasses and hats. Daebak! If you have time to spare, you can try the traditional crafts and hanbok at one of the outlet there. Ms Kim, Vera,Tere, Nat, Lucky and myself parted after having brunch at Lotteria, Incheon Airport. It was hard saying goodbyes to my new-found friends. They certainly made my trip easier and memorable. I didn’t feel scared or awkward, being the only Malaysian and Muslim in the group. I am thankful that my interest in Korea and my English language skills led me to experience Korea once again and to meet like-minded friends who are clearly crazy about South Korea! .....And so I boarded Korean Air for the first time and departed for Malaysia and reached KLIA after 6 hours of flight. My wish is to visit Korea again, meet my South East Asian friends again and fly on Korean Air one more time. Kamsahamnida, Korea Tourism Organisation! Saranghaeyo.... !